Even the ceilings are weeping at Westminster as the news of a leak at the Mother of all Parliaments surprises none. Brexit would bring a tear to a glass eye, so whether it is lingering or abrupt, we can at least be grateful the end may be within sight. There will be some relief to know the possibility of a no deal is also less likely. 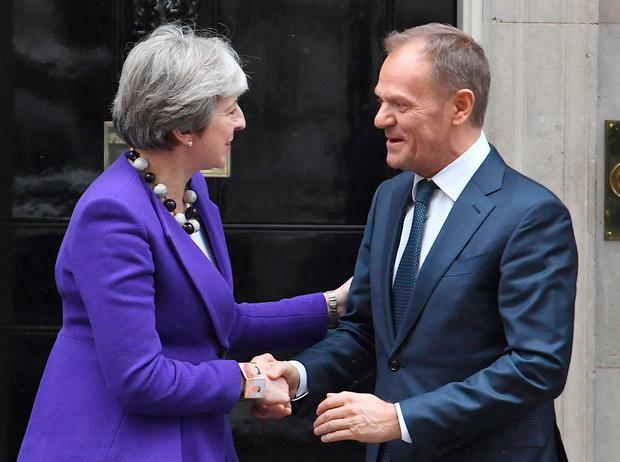 The good, or should that be not too bad, news is that British Prime Minister Theresa May has written to European Council President Donald Tusk asking to delay Brexit until June 30. The request will be "considered" in Brussels next week. As Taoiseach Leo Varadkar has said: "Ireland wants to avoid a no-deal Brexit, as does the UK, and the EU does not want a no deal either." He has highlighted the need to avoid the danger of rolling extensions. Agriculture and business all desperately need some certainty. If the UK can be out of the EU before May 23, it can avoid the European parliament elections. There are at least indications we may at last be sloping towards the beginning of some lightly baked conclusion. Alas as yet, much remains to be determined as to the new condition of things. For one: all is predicated on getting acceptance of the Withdrawal Agreement without reopening it, as agreed with the EU. For another: Mrs May's "talks" with Labour leader Jeremy Corbyn are proving painfully predictable, So far, they have produced much hot air, which shows no sign of transforming into white smoke. Chancellor Merkel's pledge to find the "will" is not being matched with a similar determination in London. Mr Corbyn still has a gimlet eye on an election. There is also the fact Mrs May's overture to Brussels may well have alienated the bulk of her party. Many would regard this as a bonus given their behaviour over the past three years. She will need support for something if next week's summit is to be "meaningful", if that word still holds currency after being put through the wringer in the Commons. Yet Mr Tusk's offer of extra time in the form of a "flextension" was intended to be facilitating. But the notion of extra time has already drawn the ire of the French. Officials close to President Macron described the offer as clumsy and premature. They have a point. Already Jacob Rees-Mogg has been busy insisting Britain should be "as difficult as possible" in the event of a long extension. If reason is, as Victor Hugo argued, "intelligence taking exercise", it can only be surmised Mr Rees-Mogg doesn't work out much. To suggest the UK should cause chaos with EU institutions is the latest asinine contribution in an irresponsible and ill-advised campaign. And still we dare to hope. But as the poet noted, "Blessed is he who expects nothing, for he shall never be disappointed."